Catherine of Austria (Polish: Katarzyna Habsburżanka; Lithuanian: Kotryna Habsburgaitė; 15 September 1533 – 28 February 1572) was one of the fifteen children of Ferdinand I, Holy Roman Emperor and Anna of Bohemia and Hungary. 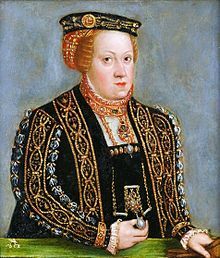 In 1553, she married Polish King Sigismund II Augustus and became Queen consort of Poland and Grand Duchess consort of Lithuania. Their marriage was not happy and they had no children together. After a likely miscarriage in 1554 and a bout of illness in 1558, Sigismund became increasingly distant. He tried but failed to obtain a divorce from the pope. In 1565, Catherine returned to Austria and lived in Linz until her death. Sigismund died just a few months after her bringing the Jagiellon dynasty to its end. Catherine was one of the fifteen children of Ferdinand I, Holy Roman Emperor and Anna of Bohemia and Hungary. She spent most of her childhood at Hofburg, Innsbruck and received education based on discipline and religion. She learned Italian and Latin languages. On 17 March 1543, Catherine was betrothed to Francesco III Gonzaga, Duke of Mantua and Marquess of Montferrat. It reflected her father's desire to strengthen Habsburg influence against France in northern Italy, particularly Milan. Both Catherine and Francesco were 9 and 10 years old at the time. The wedding took place six years later on 22 October 1549. In October 1549, Catherine was escorted by her elder brother Ferdinand II, Archduke of Austria from Innsbruck to Mantua. Her dowry was 100,000 Rhine florins. The marriage lasted only four months as Francesco III Gonzaga drowned in the Lake Como on 21 February 1550. Widowed Catherine returned home to Innsbruck. Habsburgs claimed that the marriage was not consummated to increase Catherine's chances for a better second marriage. In May 1551, after the death of his second scandalous wife Barbara Radziwiłł, King Sigismund II Augustus became a widower. Emperor Ferdinand I pursued the marriage between Catherine and Sigismund to create a pro-Habsburg group within the Polish court. Particularly, he wanted to prevent Polish assistance to Sigismund's sister Isabella Jagiellon and her son John Sigismund Zápolya in the succession disputes over the Kingdom of Hungary. Both Catherine and Sigismund personally opposed the marriage. Catherine blamed Sigismund of mistreating and causing the early death of her older sister and his first wife Elizabeth of Austria. Sigismund feared that Catherine would be similarly unattractive and of frail health as Elisabeth. However, the Habsburgs threatened to create an anti-Polish alliance with the Tsardom of Russia. In early 1553, Mikołaj "the Black" Radziwiłł traveled to the court of Ferdinand I, Holy Roman Emperor, in an attempt to persuade the emperor to cease his assistance to Tsar Ivan the Terrible. Radziwiłł had further orders to travel to investigate marriage opportunities with Mechthild of Bavaria or one of the daughters of Ercole II d'Este, Duke of Ferrara. However, the Emperor convinced Radziwiłł that marriage between Catherine and Sigismund was best. Radziwiłł wrote enthusiastic letters to Sigismund, who soon gave in and gave his consent on 10 April 1553. The papal dispensation (they were first cousins once removed) was received on 20 May and the wedding treaty was signed on 23 June. The same day the per procura wedding took place. The actual wedding was delayed due to Sigismund's ill health from 1 July to 30 July. The celebrations lasted 10 days. Catherine's dowry was 100,000 florins as well as 500 grzywnas of silver, 48 expensive dresses, and about 800 jewels. Catherine spoke Italian and therefore could communicate with Queen mother Bona Sforza and her family. She was ambitious and tried to gain political influence in the Polish court which caused Sigismund's ire. However, at least at first, he attempted to do right by his wife – he needed an heir and was acutely aware of the criticism of his treatment of his first wife Elizabeth of Austria. In February 1554, the royal couple separated for the first time. Catherine was in Parczew while Sigismund attended general sejm in Lublin. According to royal secretary Michał Trzebuchowski, the queen was very upset by the separation and kept crying. When Sigismund visited his wife on 9–10 April, Catherine informed him that she was pregnant. At the end of April, the royal couple traveled to Lithuania and on 25 May reached Vilnius where with short breaks Catherine lived for nine years. It is unclear whether it was a miscarriage, false pregnancy, or an intrigue, but there was no birth in October 1554. Relatively normal, albeit somewhat distant, marriage continued for a few more years. It seems that Catherine accompanied her husband to general sejm in spring 1555 and to the per procura wedding of Sophia Jagiellon and Henry V, Duke of Brunswick-Lüneburg in January 1556. She also continued to mediate between her husband and her father, carried frequent correspondence with Albert, Duke of Prussia, and was known for generally favorable views on Protestantism. Catherine's dowry was paid by her father at the end of 1555 or very early 1556. Therefore, on 19 January 1556, she received the towns of Wiślica, Żarnów, Radom, Nowy Korczyn, Kozienice, Chęciny, and Radoszyce. In spring 1556, Queen mother Bona Sforza returned to her native Italy and her two yet-unmarried daughters, Anna Jagiellon and Catherine Jagiellon, moved to Vilnius. It seems that the three women became close. In summer 1558, the royal family returned to Poland. In October, Catherine became severely ill. The cause of the illness is unknown as she would not allow Polish doctors near her. When her father sent a couple of Austrian doctors, they reported only high fever and chills. She recovered somewhat only in spring 1559 but her recovery was interrupted by frequent travels in summer 1559 to avoid a plague outbreak. Catherine returned to Vilnius only in early 1560 and became ill again. Sigismund was convinced that it was epilepsy, the same disease that tormented his first wife and Catherine's sister. Their marriage became very distant. In October 1562, at the wedding of Catherine Jagiellon and Duke John of Finland, the couple saw each other for the last time. Catherine lived in Vilnius and Hrodna before being sent to Radom in April 1563. 40-year-old Sigismund sought to obtain annulment of the marriage as he wanted to marry for the fourth time and secure a male heir. In January 1565, Sigismund complained to papal nuncio Giovanni Francesco Commendone that marriage to Catherine was sinful because she was a sister of his first wife, that she hated Poland, that she caused the miscarriage in 1554, and that he was physically disgusted by his wife due to her epilepsy. Due to Habsburg influence, Pope Pius IV did not allow the divorce. In July 1564, Ferdinand I, Holy Roman Emperor, died and was succeeded by his son Maximilian II. The new emperor sent his diplomats Andreas Dudith and Wilhelm von Kurzbach to try to reconcile Sigismund with Catherine or, if that failed, to convince Sigismund to allow Catherine to leave Poland. The plan for Catherine to leave was brought up to Sigismund in May 1565. Initially he refused, fearing that it would only increase the anti-Polish sentiment in the Habsburg court, but later changed his mind because he believed that Catherine's departure would make it easier to obtain a divorce. In late 1565, she departed to Wieluń. However, Polish nobles interfered and her departure to Vienna was delayed until 8 October 1566. In a letter written to Albert, Duke of Prussia, a day before her departure, Catherine expressed her resolve to one day return to Poland. Catherine did not receive a warm welcome in Vienna as she was blamed for the failed marriage. Emperor Maximilian II extended her stay and wanted to meet with Sigismund personally to discuss the issue. Sigismund refused. In March 1567, Andreas Dudith relayed that Sigismund categorically refused to live with Catherine (reportedly, he once said that he would gladly become a monk if that meant he could get rid of Catherine) and that he would not protest if Catherine remained in Austria. At the same time, Sigismund would not specify where Catherine should live if she returned to Poland and would not allot money for her court. Thus, in effect, he precluded Catherine from returning. In June 1567, Catherine became seriously ill with what doctors called melancholia. In October, after recovering, she moved to Linz where she lived out the remaining five years of her life. According to a witness, Catherine lived like a widow. She received 28,000 guldens annually from Sigismund for her court of more than fifty people. She was visited by her family, she studied Bible and other theological works, she established a garden for medicinal herbs and produced various herbal remedies. It seems that she still wanted to return to Poland: she tearfully asked Giovanni Francesco Commendone for help when he visited her twice and kept writing letters to her husband. In her last will, she asked her husband for forgiveness and left him all jewelry she received from him. The majority of her cash was left for charity. Catherine died on 28 February 1572 and was buried in castle's chapel. When Rudolf II, Holy Roman Emperor, ordered reconstruction of the castle, her body was moved to the St. Florian Monastery on 22 September 1599. A solemn funeral was organized only by Emperor Matthias on 22 September 1614. The surviving sarcophagus was built in 1781. ^ Cazacu, Matei (2017). Reinert, Stephen W. (ed.). Dracula. Brill. p. 204. ^ a b c Holland, Arthur William (1911). "Maximilian I. (emperor)" . In Chisholm, Hugh (ed.). Encyclopædia Britannica. 17 (11th ed.). Cambridge University Press. ^ a b c Poupardin, René (1911). "Charles, called The Bold, duke of Burgundy" . In Chisholm, Hugh (ed.). Encyclopædia Britannica. 5 (11th ed.). Cambridge University Press. ^ a b c Wurzbach, Constantin, von, ed. (1860). "Habsburg, Elisabeth von Oesterreich (Königin von Polen)" . Biographisches Lexikon des Kaiserthums Oesterreich [Biographical Encyclopedia of the Austrian Empire] (in German). 6. p. 167 – via Wikisource. Duczmal, Małgorzata (2012). Jogailaičiai (in Lithuanian). Translated by Birutė Mikalonienė; Vyturys Jarutis. Vilnius: Mokslo ir enciklopedijų leidybos centras. ISBN 978-5-420-01703-6.